Flying began on the site of what was to become RAF Sawbridgeworth during the First World War. In April 1916 a 2nd Class night landing ground for North Weald aerodrome was established to the west of Shingle Hall for use by 39 Squadron of the Royal Flying Corps, who were engaged in the defence of London against high altitude German bombers and airships. The landing ground closed in November 1918 and the land returned to agriculture for ten years until a short-lived gliding club was formed at Shingle Hall in 1928. In 1933 the British Hospitals Airfield Pageant visited Spellbrook Landing Ground at Shingle Hall. The pageant included aerobatic displays, formation flying, wing walking and daring stunts such as the picking up handkerchiefs with a wing tips. Among the pilots participating was Pauline Gower, who later founded the Women’s Section of the Air Transport Auxiliary in 1939. The RAF placed a mobile beacon on the southern edge of the WW1 NLG in 1934 for use as an emergency landing ground, but there are no records of it having ever been used. In 1937 the RAF established an Advanced Landing Ground north of the Much Hadham road and west of Mathams Wood for training squadrons of the 22nd Army Co-Operation Command. Mathams Wood ALG, as it was now known, was used intermittently until the outbreak of the Second World War. No permanent buildings had yet been built so accommodation for all personnel was under canvas. June 1940 saw the arrival of two flights of Westland Lysander equipped 2 (Army Co-Operation) Squadron RAF, who had recently returned from France following the evacuation of the BEF. 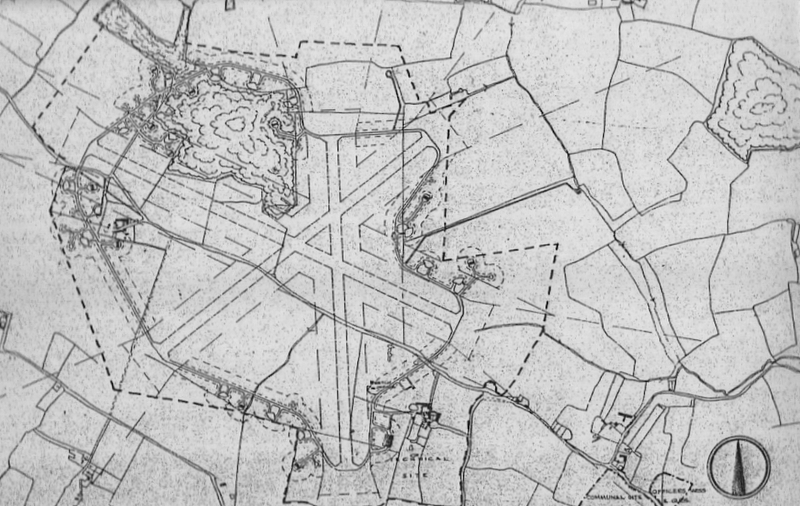 Land south of Mathams Wood was used to accommodate a Sommerfeld track NW-SE runway . This was organised by the CO of 2 (AC) Squadron, Wing Commander A W Geddes, who was instrumental in the development of the airfield. Instead of going through the usual time consuming official channels he used local contractors to carry out the work required. Many local buildings were requisitioned; Great Hyde Hall as Station HQ, Shingle Hall Farm, Blounts Farm for flight offices and photographic section, Townsend House and Glenroy for the equipment section and accounts. 2 (AC) Squadron completed their move in October 1940. Although officially still known as Mathams Wood ALG, W/Co Geddes used ‘RAF Sawbridgeworth’ as his address on correspondence and after many phone calls from the Air Ministry demanding to know exactly where RAF Sawbridgeworth was, it became accepted as the station’s official title. In due course RAF Sawbridgeworth became a Class A airfield. Two more Sommerfeld Track runways with Drem lighting were added. A concrete perimeter track was laid with dispersals, hardstandings and hangars, along with technical and dispersed sites to accommodate over one thousand station personnel. 2 (AC) became the station’s longest serving squadron, staying for over two years, spread over ten visits from June 1940 to April 1944. Curtiss Tomahawks replaced the Lysanders in 1941 but proved to be troublesome, and so in turn were replaced by North American Mustangs in 1942. In strict secrecy, 2 (AC) Squadron’s CO, W/Co Geddes, was tasked with the training of pilots for the Special Operations Executive (SOE) in 1941. The appearance of black Lysanders and mysterious strangers in the mess puzzled many squadron members who weren’t ‘in the know’. Several other squadrons were based at RAF Sawbridgeworth, including a brief stay for 809 Squadron of the Fleet Air Arm, equipped with Fairey Fulmars. 182 Squadron with Hawker Typhoons stayed for a month at the end of 1942 for training but the airfield proved unsuitable for such heavy aircraft. It was a similar situation with Mosquitos of 4 Squadron. The last squadrons based at Sawbridgeworth were 80 & 126, flying Spitfire IX’s. Among the several high ranking visitors to RAF Sawbridgeworth were Viscount Trenchard, known as ‘father of the RAF’ who paid a visit with AVM Arthur Barratt in July 1941, Air Chief Marshal Sir Hugh ‘Stuffy’ Dowding, C-in-C of Fighter Command during the Battle of Britain, and Sir Archibald Sinclair, Secretary of State for Air. Army Co-operation Command relinquished command of the airfield at the end of May 1943 and RAF Sawbridgeworth came under Fighter Command but was reduced to Care and Maintenance status two months later. RAF Sawbridgeworth was also home several ground units, one of whom, the Base Signals & Radar Unit, stayed for four months while awaiting posting overseas. Shortly after leaving Sawbridgeworth in October 1944, their ship struck a mine off the Belgian coast resulting in the loss of 234 Officers and men. After D-Day and the advance in to Europe, RAF Sawbridgeworth, like so many other airfields, became redundant and flying ceased in November 1944 when the station was transferred to Maintenance Command.